Step right up, get your free passes, get your free passes. Oops, not you Mr. Bush. Only everyone else gets a free pass. You are unique because we hate you so much. Here you get blame. And all those on the left said "Sure that's credible. They will take us seriously. Won't they?" Andy, I'm beginning to think your site is a spoof it is so unbelievable. Maybe you are actually a GOP trying to paint the left as kooks. Well, if criticizing Bush over his inept handling of this crisis makes me a kook...then I am in good company with Fox News, The Wall Street Journal, Washington Post, and just about every major news organization and journalist out there. 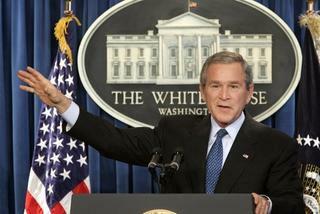 I think you, Karl Rove and Condi Rice are the only people sticking to the "Bush did a great job" spin. That's ok. I feel for ya pal. Hey Thanks! Nice, objective article! Had I truly wanted, on my own, to find a web site that said "the President's main responsibility lies with the fact that one of the members of his administration looks to have done a poor job of managing the federal government's portion of planning and responding to this crisis" (and also goes on to place about 90% of the blame on Democratics Mayor Nagin of New Orleans and Gov. Kathleen Blanco)...I would've been lost! But thanks to you I now have this truly objective piece of journalism. You should be proud! Unfortunately, there are really stupid people who will believe the spin from the White House. And, though I hate to think it, I believe the W.H. press corps will bow to the bushies when they find they aren't invited to special events at the W.H., and when McClelland doesn't call on them for questions. Oh, I hope that what I'm thinking is just B.S. and that the press will keep its spine. It was so refreshing to hear even those on Fox News get angry at the posturing of politicians and pundits. I've got to hand it to you, you stay on the bash Bush theme very well. No facts get in your way of a good Bush bash. Your "Objective" posts still blame Bush 100%. The article I pointed to is objective in that it at least fairly spreads the 100% across multiple entities. You can claim non-objectivity in the actual percentages, but at least the article has both eyes open - not just one eye on Bush. The lesson of this is that no beurocratic government agency can be trusted with your life, health or wealth. The individual should take these lessons and never place their faith in a government agency. Andy, why do you continue to debate Popeye? He is what he is and that's all that he is. A Bush Muncher. Please use the time you spend answering his partisan phlegm blogging MORE. We need your voice, yo. Anonymous, because Andy like a moth to the porch light is so attracted to the truth. Ok, just having fun with you guys. I would however appreciate a few points on how this blog is objective and non-partisan. That is a tough stretch for my feeble mind. Cheers. I think the only person pretending to be non-partisan here is, well, you. Does the author back up his points with actual facts? Always. That's what makes this blog special. And possibly why it gets so under your skin. Anonymous, you da' man, as they say. Thanks for pointing out my Blog description. Seemed like an obvious thing, but I guess not. As for your question, call me crazy, but I still believe there's hope for guys like All I Can Stand. I guess that's the fundamental difference between us liberals and Republicans: we're always trying to help those less fortunate. Anon and Andy, Of course I knew you were partisan hacks. I was addressing Anon. reference to my "partisan phlegm" as if there was none here. As for the comment on helping the less fortunate, this is laughable. Libs may give out fish, but a true caring conservative will teach the person how to fish. Creating a dependency is not help. Helping the individual to independently self-sustain is the best help one can do for their fellow man. I never claimed to be non-partisan. I do claim to be objective and my posts reflect that. The posts here don't even pretend to be objective, yet other viewpoints are branded as not being objective. I was pointing out that your comment of the link I sent being non-objective was highly hypocritical. But hey, it's a free country, you are allowed to be hypocritical. And don't flatter yourselves. Your fact-challenged posts don't get under my skin. I come here for entertainment. I'll try hard to leave you guys alone for awhile. Don't want to slow down Andy's posting. When you finish a few maybe I'll come back.